This is an “engagement” technique for labor to use only after 10 contractions with Abdominal Lift and Tuck. Walcher’s Position will allow contractions to engage a baby that is high, not really in the pelvis yet. The baby may be stuck at the brim or inlet of the pelvis. Use this position through and between three contractions in a row to lower baby into a normal pelvic brim. Contractions make it work. Pictured: The mother’s legs hang off the edge of the bed from the top of her thighs. This makes a huge arch in her back. Ouch for some! A roll is used to create comfort in the curve that is exaggerated by this position. This technique is only used when other techniques fail. I’m lifting her calves from far beneath the knees so her knee-caps are not hurt. Walcher’s is for use in labor, but let’s give a little background on engagement. First babies normally engage by 38 weeks of pregnancy. Subsequent babies may engage before labor begins, or will usually engage with early labor contractions. Engagement means the widest part of the baby’s head has dipped below the entrance to the pelvis (the brim). Standing and allowing the belly to hang forward (lordosis) keeps the brim open enough for the average baby to engage nicely. However, lack of engagement can be a cause for cesarean birth when labor contractions can’t get the baby into the brim of the pelvis. Baby has to get into the pelvis to get through the pelvis. There are various maternal positions to open the pelvic brim more so baby can engage. Dr. Walcher taught his technique for unusual cases when the baby couldn’t engage and labor had already begun. He wrote a description in the late 1800s about moving a laboring woman to the edge of the bed and letting her legs hang off so the weight of her legs could pull her symphysis pubis far from her spine. The wide arch opens the anterior posterior (AP) diameter to let the baby’s head enter the pelvis. Walcher’s position is done off the side of a high, firm bed. Legs hang freely! (Yes, even though Dr. Potter put stools under mother’s feet). The pubic bone is the highest bone, opening the pelvis to let baby in during labor contractions. If a woman was birthing at home and didn’t have a high bed, she could lay on her floor or on her low bed and use a “Trochanter Roll.” This is a 15″ firm roll of bedding or a yoga bolster or such placed under the cheeks of the buttocks at the level of the trochanter of the thigh. Alternatively, we can open the pelvic brim in a deep birth pool. Each of these opens the AP diameter of the pelvis. 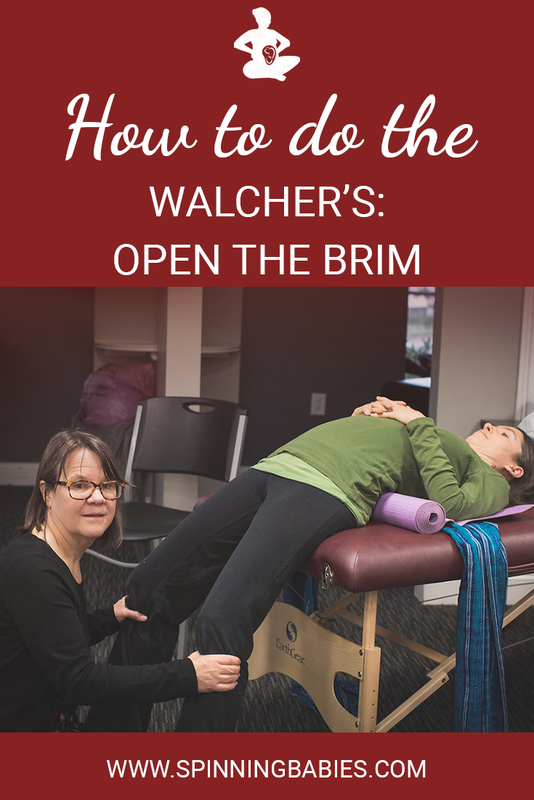 Walcher’s position opens the brim front to back. The pubic bone opens away from the spine. This makes more room for the baby to get into the pelvis. Kneeling opens the brim. A back bend opens the brim. Standing and letting the belly hang opens the brim a little. Walcher’s opens the brim a lot. Slouching closes the brim. Squatting closes the inlet while it opens the outlet. Use Walcher’s when strong, frequent contractions are not helping baby to engage. The head may overlap the pubic bone or not, this is not visible usually but can be felt with your fingertips at the top of the symphysis pubis. The baby is likely to be posterior. The chin is likely to be lifted (extended). One or both of these may be the reason, or it may be that the mother’s pelvic inlet is a bit narrow front-to-back (AP diameter) for her baby’s head. How do you do Walcher’s? The laboring woman’s legs hang off the bed into the air. The legs are NOT supported. The weight of the hanging legs pulls the pelvis open more at the inlet. The edge of the bed is at the “smile” at the lower border of the buttocks. This is the level of the trochanter of the thigh bone (near the hip socket) but at the woman’s back. A good support person will keep close eye contact with her face and speak soothingly to her through the approximately 15 minutes that it takes for 3 contractions to come and go. Alternative: Trochanter Roll. Have the birthing woman lie over a large, tight and firm roll. The roll is placed at the top of her thighs, right where her thigh bone connects to the hip socket. That’s the trochanter of the femur. This is lower than the sacrum where you might imagine she needed support. The mother lays back like that, almost a backbend, through three contractions. She remains there in between the contractions, too. It’s tough. Her lower back is not supported. Don’t put the roll at her sacrum. It goes at the top of her leg bone. How does one open the pelvic brim in a water birth? In the pool, It’s easy to bring the knees far from the abdomen. Her knees are further from her head than her hips. The mother’s feet are actually out of the water! This creates the space at the top of the pelvis to help baby engage. The mother holds the position through three contractions in a row. I first noticed the woman in “The Long Labor that Wasn’t” doing this in her birthing tub and asked her to continue with it. I’ve since suggested it for other women in the birth tub. Other uses of Walcher’s are during a breech birth or shoulder dystocia. Those uses are not listed here, as the provider would have to have a clear understanding of the application of Walcher’s in those situations. This page is more general. Engleman reported on Midwifery use of this open brim position in 1882. Dr. Walcher then wrote about it and it’s been known by his name ever since. …Now it was apparent that the baby was not at all low. She had a little cervix left, but it soon left (opened to full dilation at 10 cm). She’d gently pushed an hour in the bathroom and actively for another 30 minutes in the tub (after her cervix was found to have opened fully) and yet the baby wasn’t coming down. In fact it was rather high. I suggested Walcher’s variation for the birthing tub. She didn’t seem to like me or my suggestion right at that moment, the laughter was over. She seemed to really want the relief of the tub. But contractions pressed the baby hard on her pubic bone. Once she said that I knew what was needed was to open the brim (pelvic inlet) and let the baby’s head slip off the front of her pelvic bone. So I suggested opening her brim in the tub (with the Walcher’s variation) by being on hands and knees but having her knees far away from her belly, not spread open far, just hip width, but far from her belly so her feet are up and out of the water. She didn’t care to do that. After a while when she asked why her baby still wasn’t coming, my friend’s midwife partner asked her if she would try my suggestion. She now did and it took 3-4 tries (it was hard to stay in that open position when the contraction peaked) but at least once she did and the baby slipped into the pelvis and progress resumed. In 7-8 pushes the baby was born in the water. She was a little slow to start but didn’t need help other than suctioning her mouth and nose, rubbing her and lifting her back a little to “open her wings” so her lungs could inflate. (Rather than have her shoulders cuddled together over her chest the back is straightened so that her shoulders arch back as if she were in a standing posture but she is still in her mama’s arms.) I was tickled to have helped a family out and possibly prevented a homebirth transport with the combination of techniques. Walking briskly, chiropractic, Standing Sacral Release, and sitting upright are helpful for engagement. Sitting with feet wide apart on a firm exercise ball (birth ball) and making vigorous circles on the ball can help. 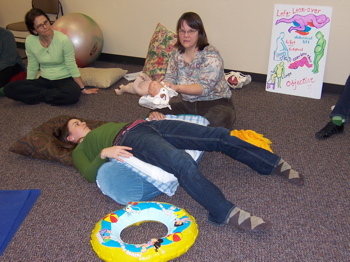 It’s good to rotate the posterior baby before forcing engagement when there is time to do the various methods and techniques for rotation in pregnancy and/or labor. When the baby’s head or shoulders are not stuck on the pelvic brim. When baby has engaged and/or isn’t stuck at the brim. Effectiveness is usually found in 3 contractions. If not effective, recheck maternal position and if incorrect, correct the position and try for 3 more contractions. Use Walcher’s before agreeing to high forceps or a cesarean when labor doesn’t progress simply because the head isn’t engaged. This position was designed to avoid “high forceps” which were in more common use over 100 years ago. Once the baby is in the pelvis (engaged) then labor may proceed quickly. If not, continue with encouraging labor in appropriate ways. Old Obstetrics literature sites the first description coming from Italy in the mid-1700s. Dr. Walcher’s in Stuttgart, Germany described this position carefully to German obstetricians over 100 years later. Dr. Comstock of St. Louis sang the praises of Walcher’s technique in an 1897 Obstetric review called The Medical Brief. After a short and bright promise, the position was soon lost to American Obstetric literature. Walcher’s reappears today in my 2011 article in Midwifery Today. 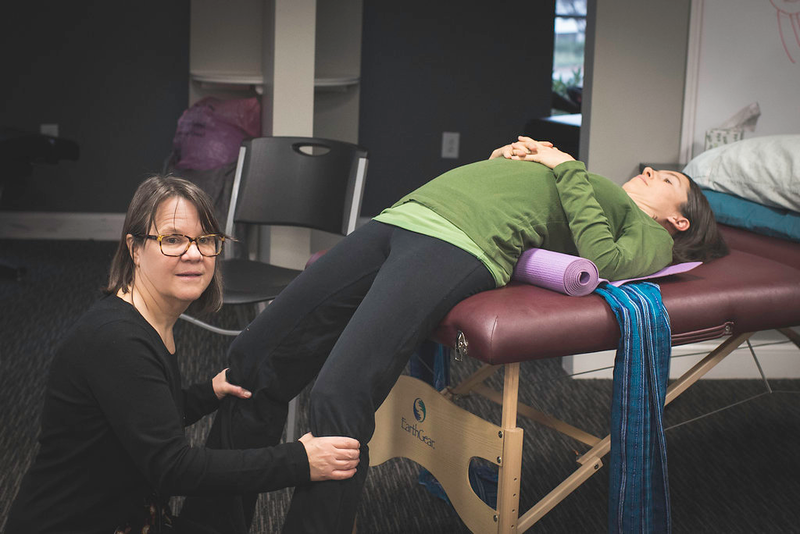 The Trochanter Roll is a variation in which I learned from a local nurse-midwife using an adaptation of Walcher’s for when the bed is low, or the woman is on the floor (see 2nd photo of the article). Walcher’s in the pool, or the Open-Knee Stretch is an adaptation I took advantage of when watching women labor with posterior–asynclitic babies and then asking them to hold that instinctive position through 3 contractions in a row. I haven’t seen this fail to engage a baby when the mother was in a non-progressing labor combined with lack of engagement in the 5 years since I’ve come across the position, but I haven’t seen everything, either. Still, it’s pretty amazing!